This eight-themed IIPA clocks in at 88 IBUs and incorporates eight hop varieties, including Galaxy, Mosaic and Simcoe. Ahoy, mate, there’s gold in that vessel, topped with clouds of a thousand shades of cream. More than enough hops to satisfy the most serious IPA skipper-sipper. Distinctive of nose and palate. Good malt backbone provides malty flavors to contrast the resinous addition of eight hop varieties. To eat, seafood, of course! I can envision homard fra diavolo, but given what’s local, substituted Washington crab, mussel, oyster, crab, and halibut seafood cioppino; early asparagus with lime pickle and water crackers; and quartered navel oranges. This is as pale in color as it can get. Original foaminess dissipates to softly linger. Immense chill haze dissipates while lingering in the glass. Malty underpinning supports American citrusy hop aroma and fresh-cut grass character. A wonderful accompaniment to springtime? 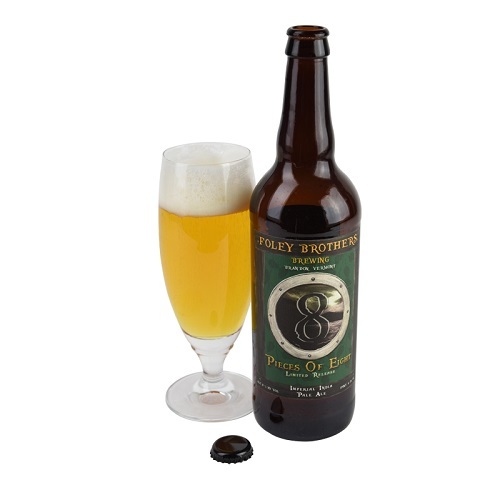 Earthy herbal hop sulfur notes create a nice deliciousness and pleasant balance in flavors. Complexity, mystery and beautiful drinkability; smooth and beautiful. Be fooled and have fun with this well-made brew.